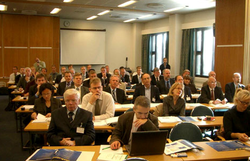 CalGE offers workshops on various subjects for professionals, executives and researchers. These conferences and workshop are offered at Stanford University, UC Berkeley, and other public and private universities in California. Classes are taught by universities professors and industry experts in English. Real time translation are provided if necessary. A typical five day workshop is scheduled as follows. All activities are between 9 AM and 5 PM if not otherwise arranged. Day 5: Concluding lectures, presentation, social gathering with local government officials, industry executives and professors. Additional days, up to 14 days total, and additional activities can be offered.